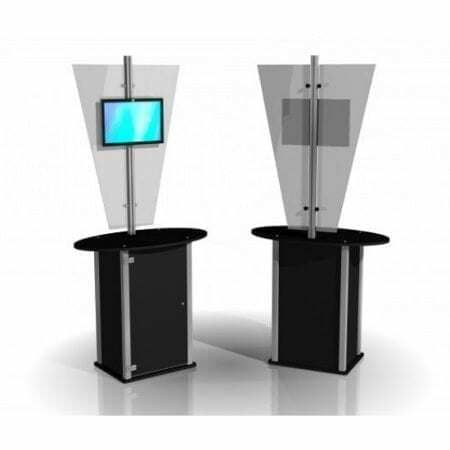 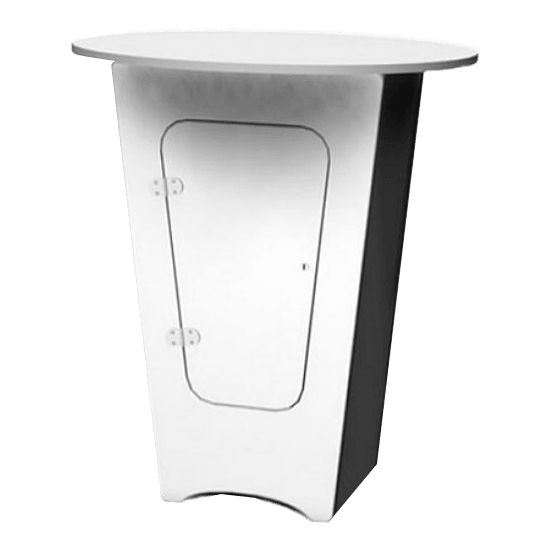 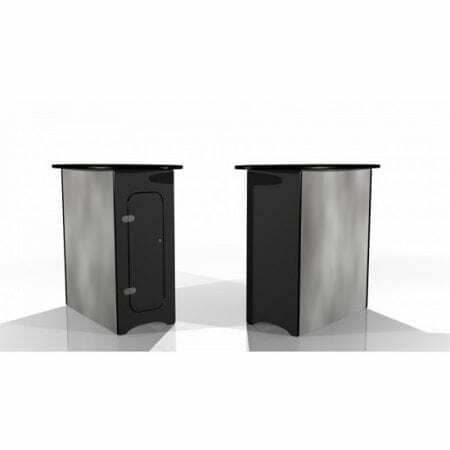 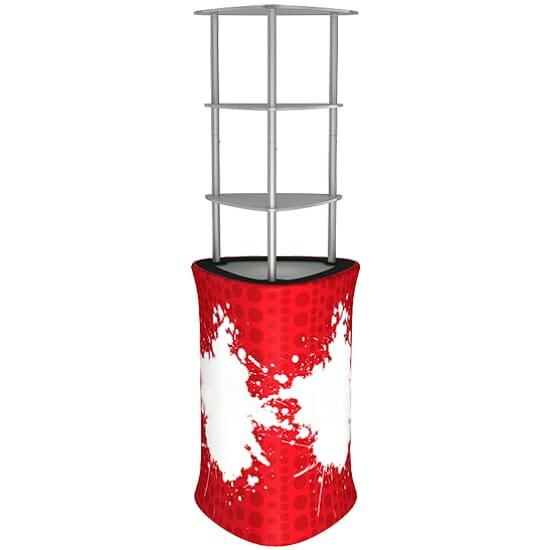 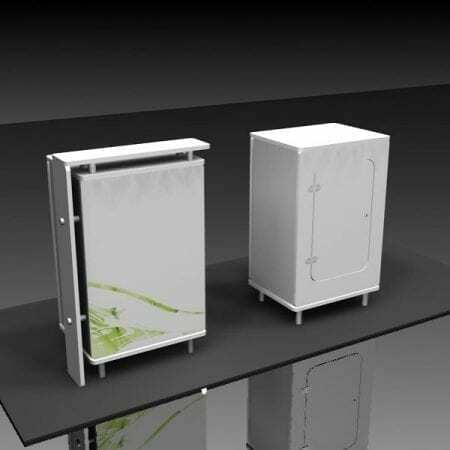 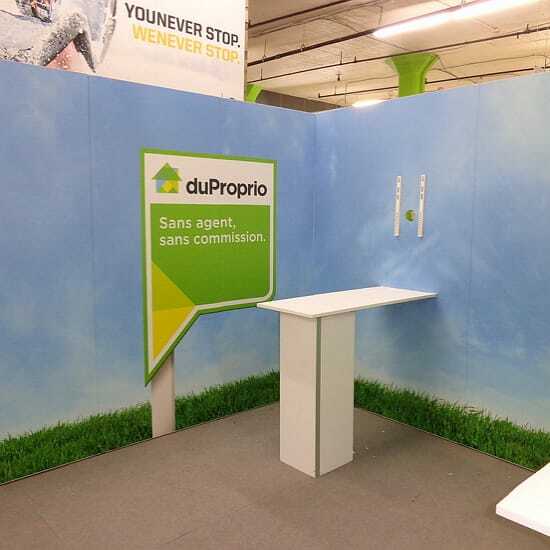 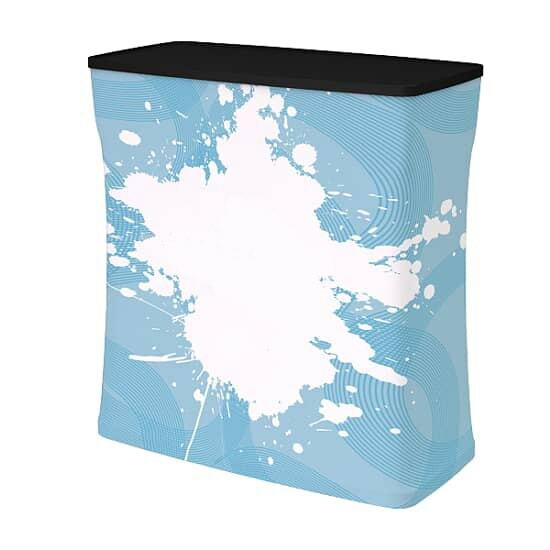 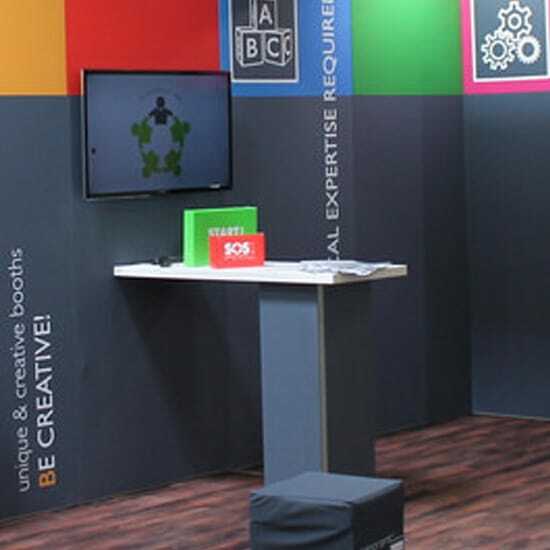 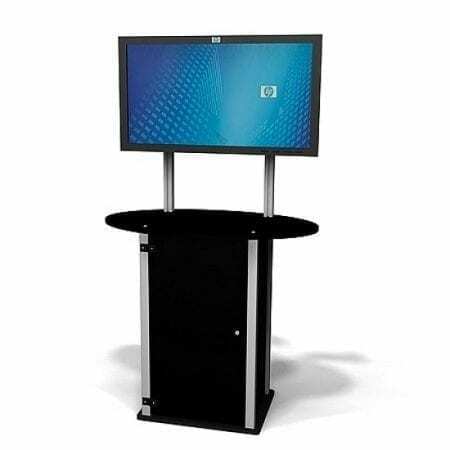 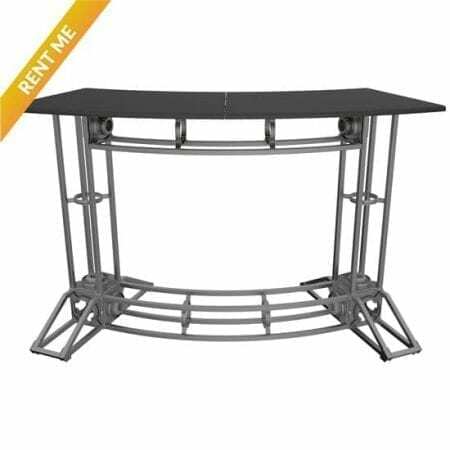 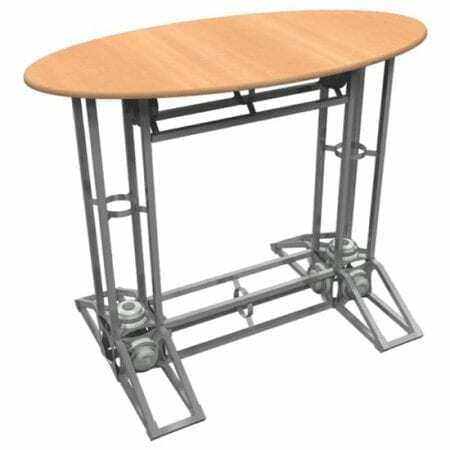 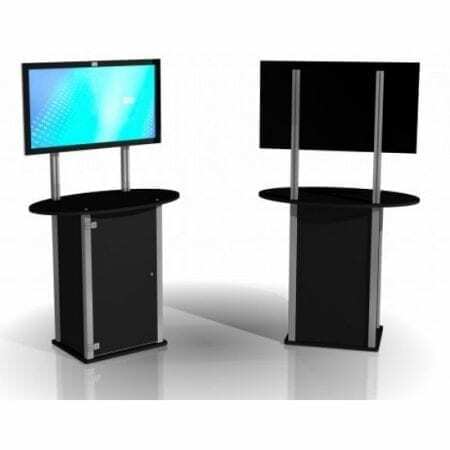 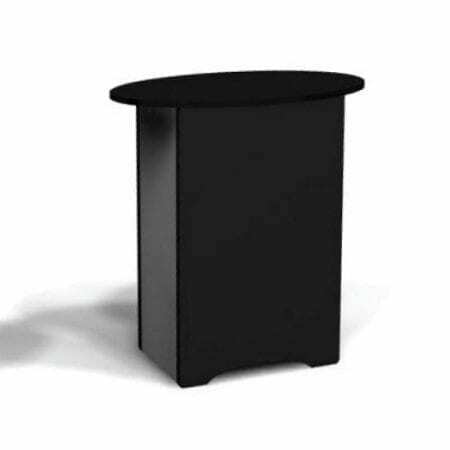 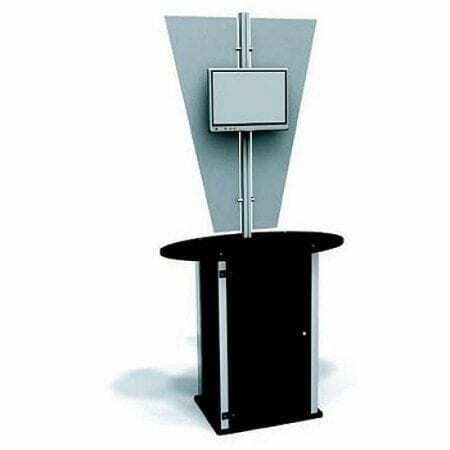 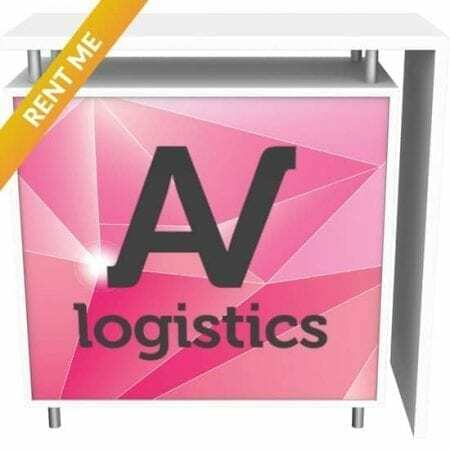 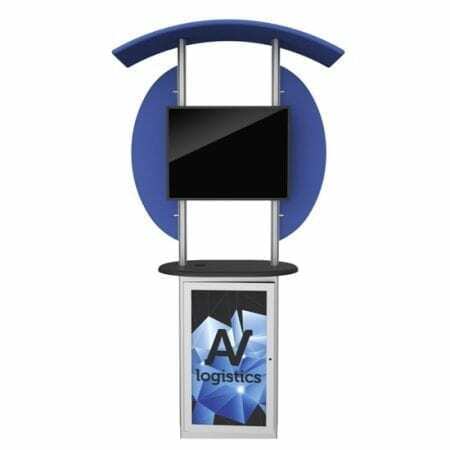 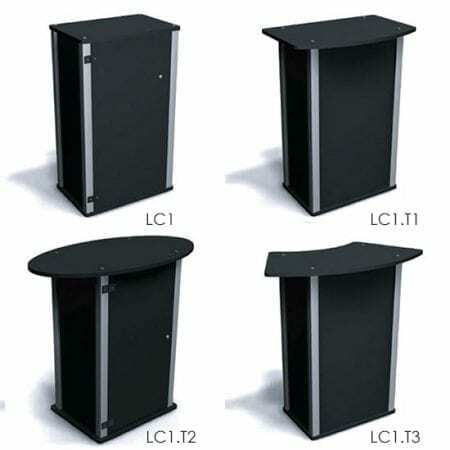 Our large selection of Portable Podiums and Counters, multimedia kiosks and portable fabric podiums will easily integrate with your existing booth and other exhibit and trade show furniture. 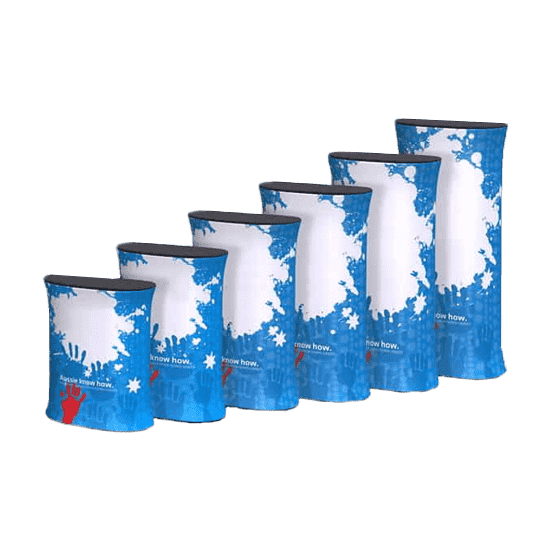 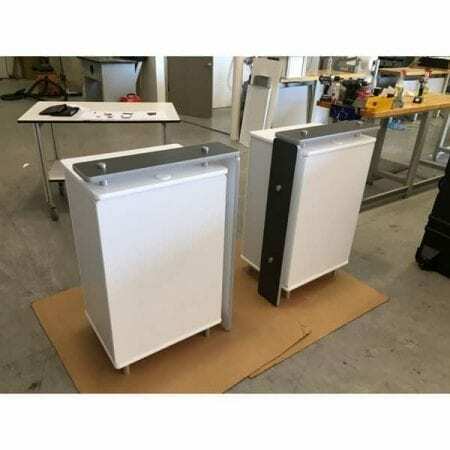 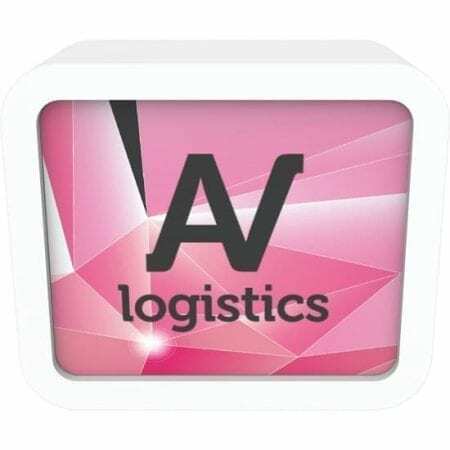 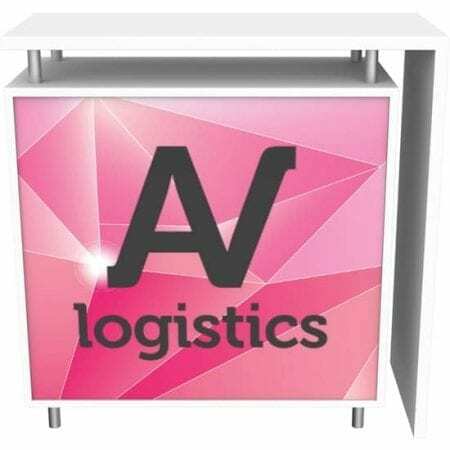 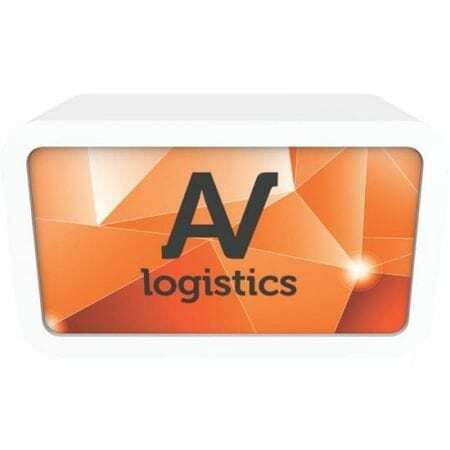 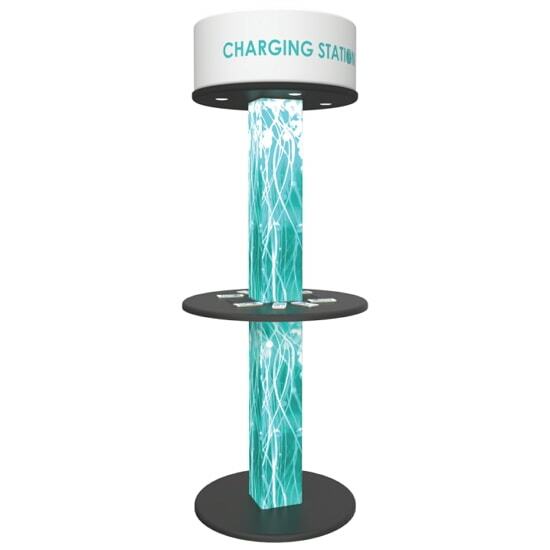 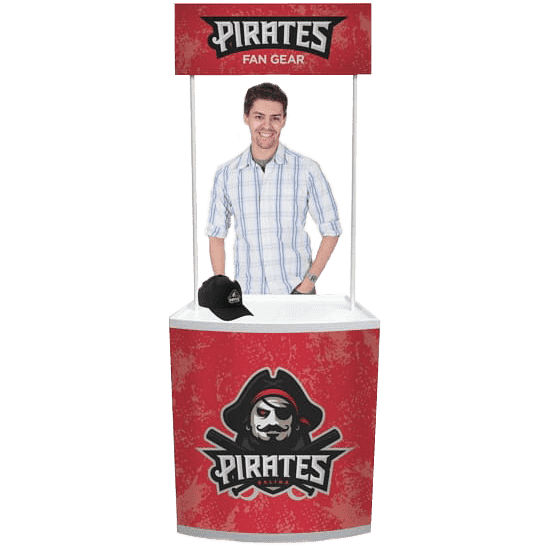 They can be economically transported using common carriers in their shipping cases, deployed on-site without tools and mounted with custom-printed graphics to enhance your branded environment. 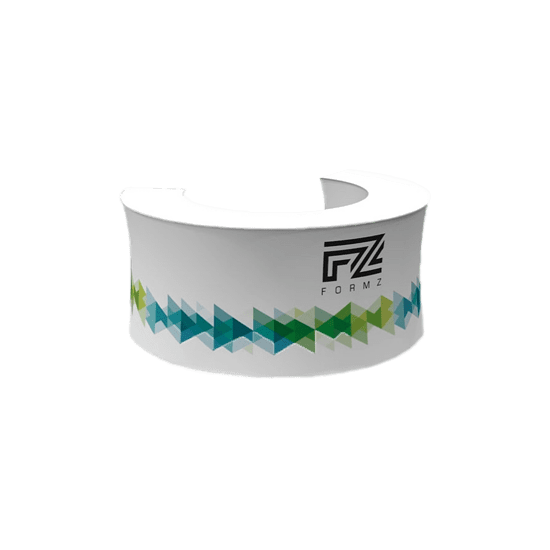 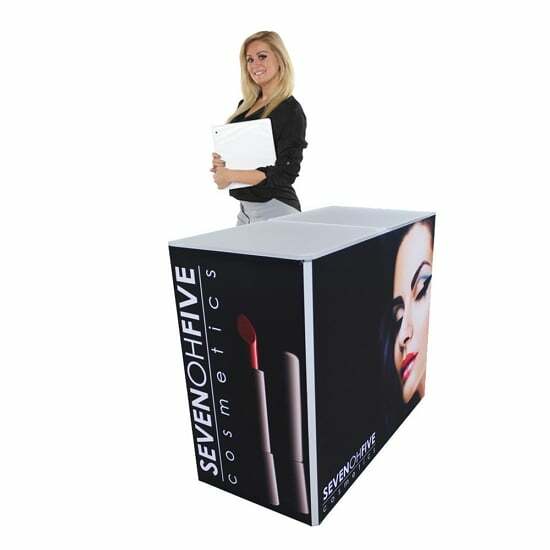 Some of our most lightweight and portable counters can be used as a demo counter or promotional table for your indoor or outdoor marketing event to showcase your products. 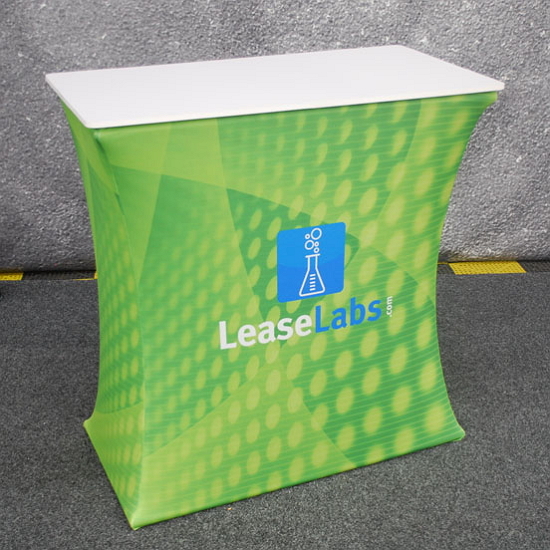 Use one of our Portable Locking Counters as a demo station, greeting podium or information kiosk. 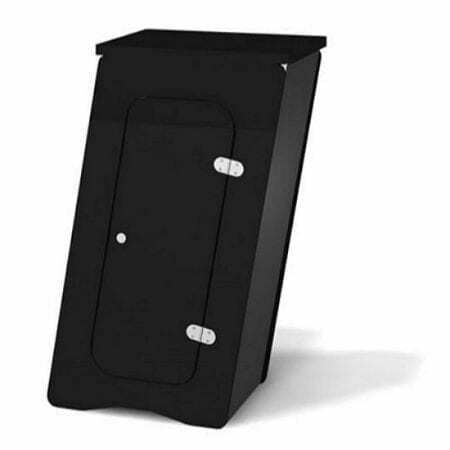 Locking doors allow for secure, easy access to your products, computer, or valuables. 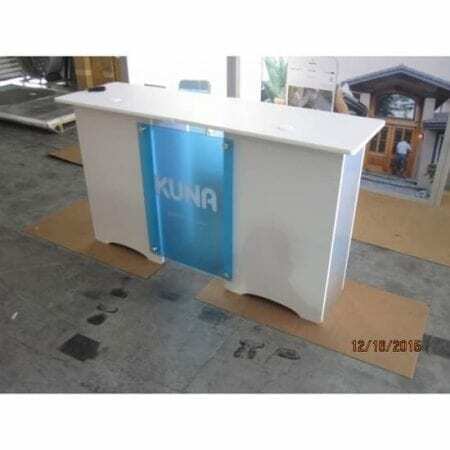 The Portable Locking Counters is an attractive way to keep valuables or product samples secure and out of view. 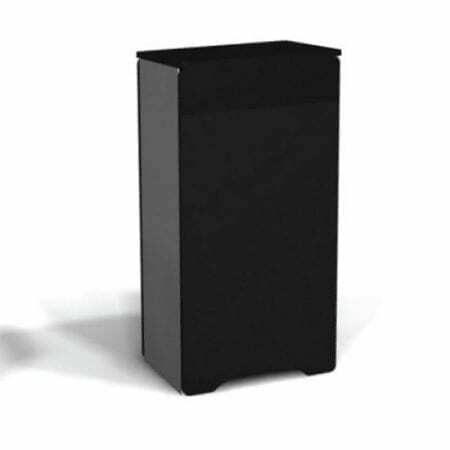 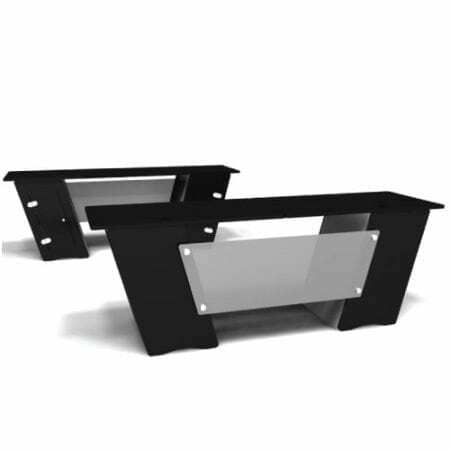 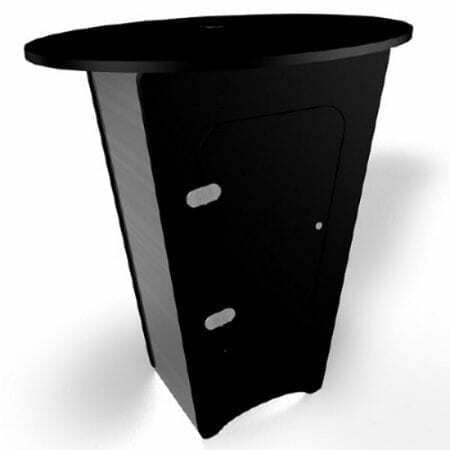 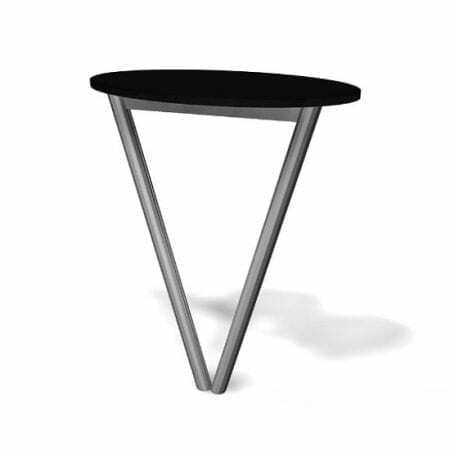 Its design features a modern, tapered base and two internal storage shelves. 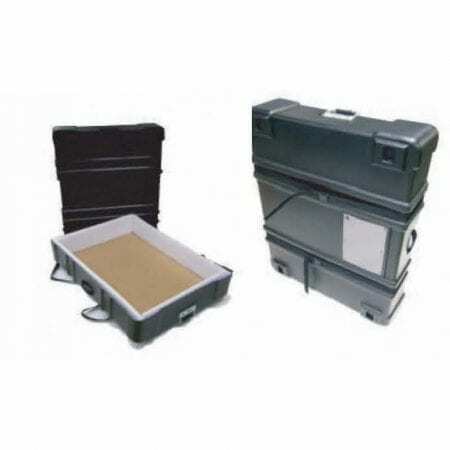 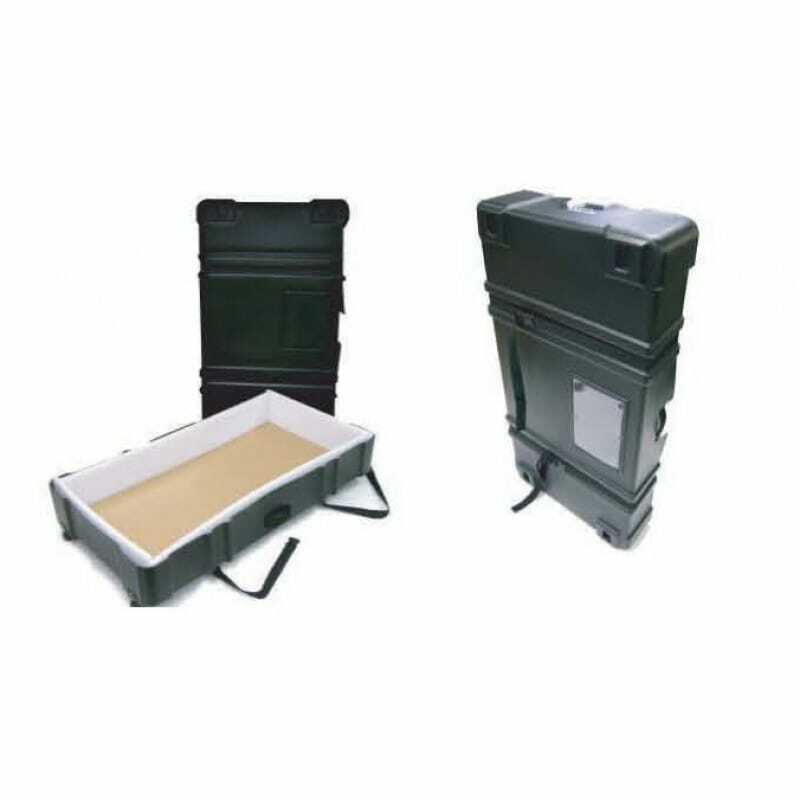 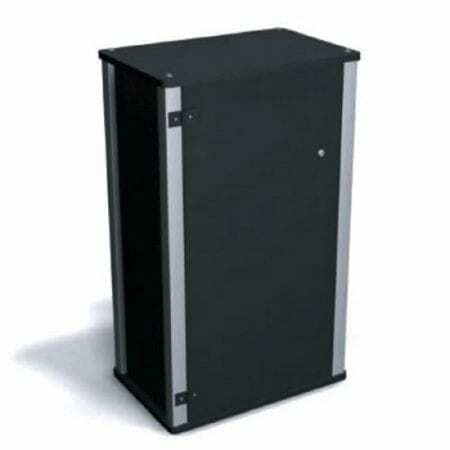 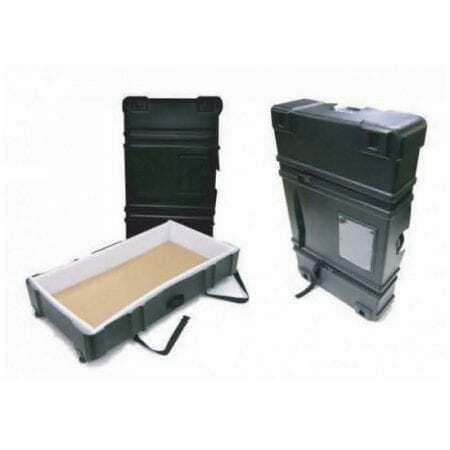 Options include a counter with a custom-printed front panel and a wheeled shipping case. 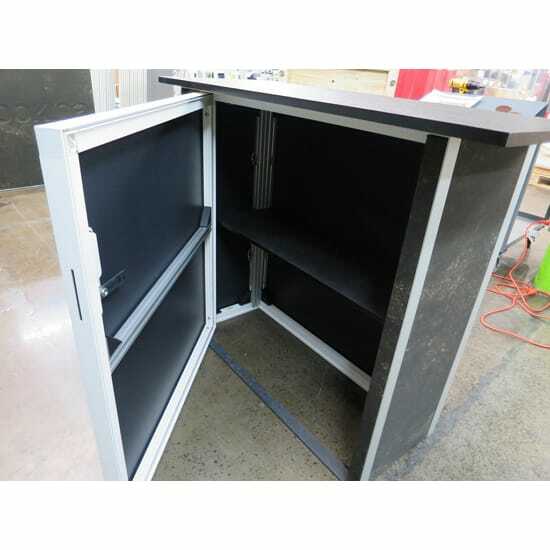 All Hybrid Pro Modular counters feature accessible storage and locking doors. 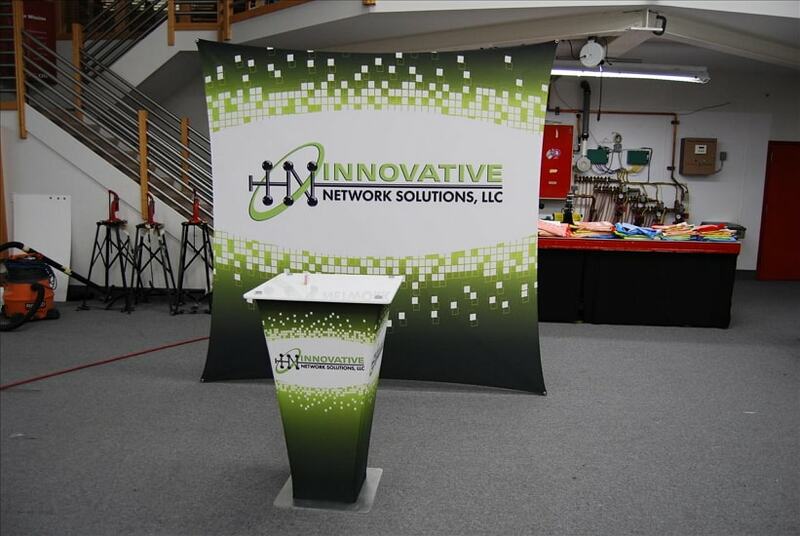 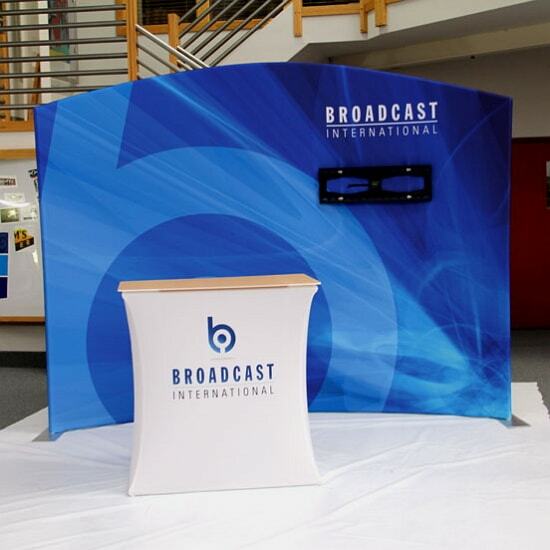 Printed fabric graphics or rigid printed panels allow you to incorporate your messaging and branding. 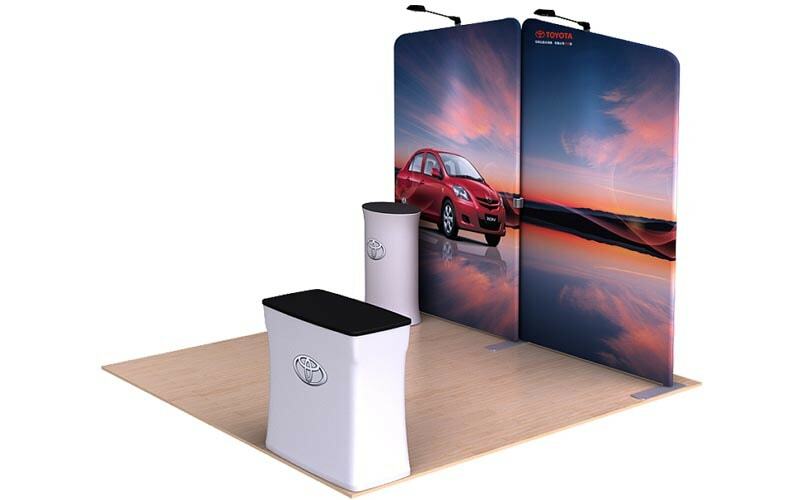 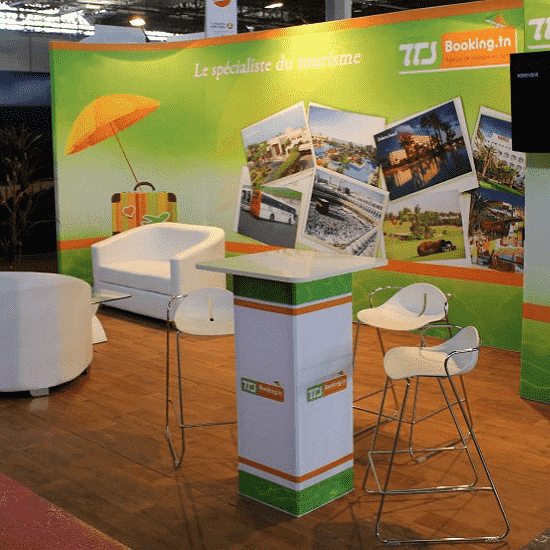 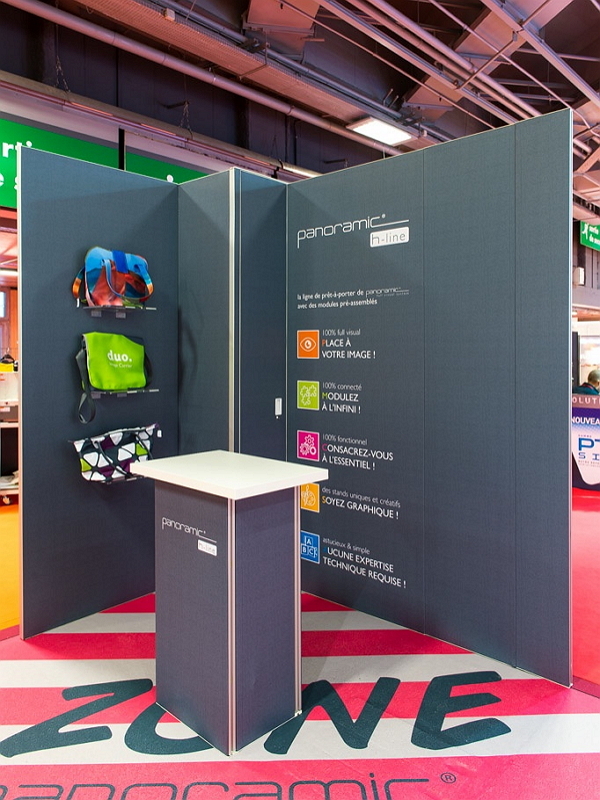 Choose from a variety of sizes and counter shapes to best match your Hybrid Modular Trade Show Displays or stand-alone space best. 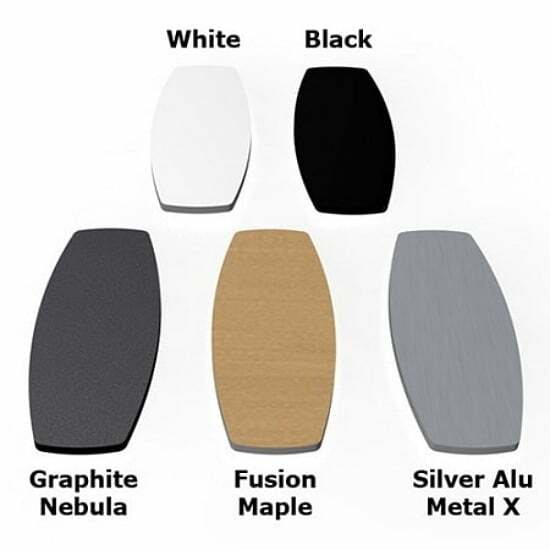 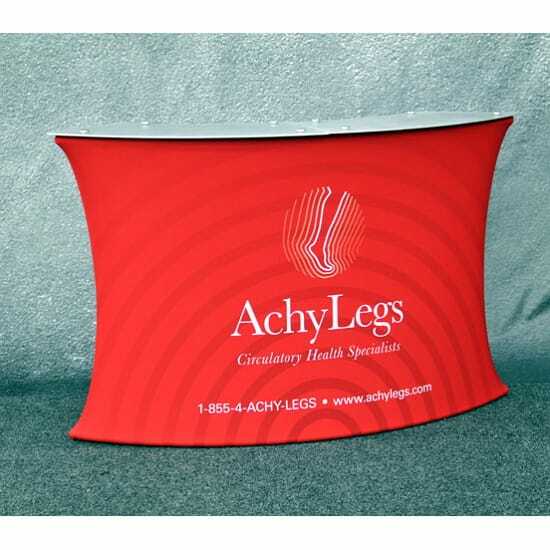 Our Portable Fabric Podium line (#PC-BS-01) features a highly compact design, with a sturdy aluminum frame and a stretch fabric skirt with full color custom print and ZIPPER in the back for storage access, in a compact, portable carrying case. 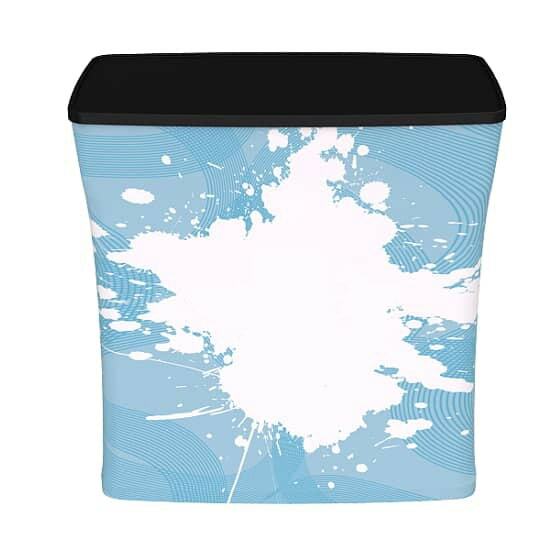 Easy graphic replacement; carrying bag included. 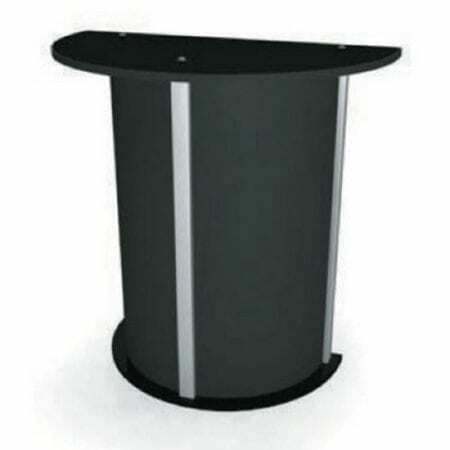 Podium top available in black only. 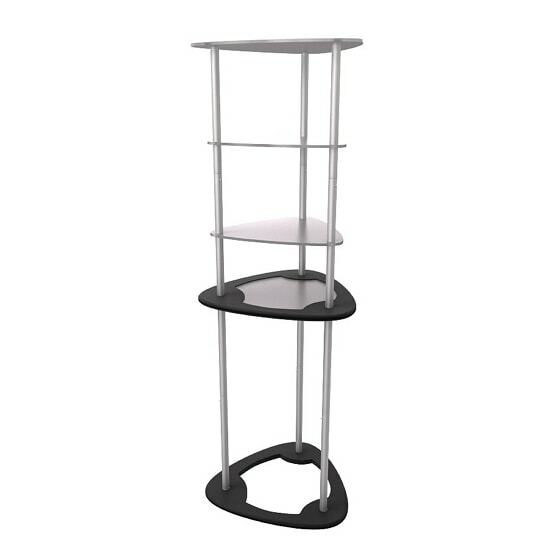 Shelf (as shown in brochure) is no longer available. 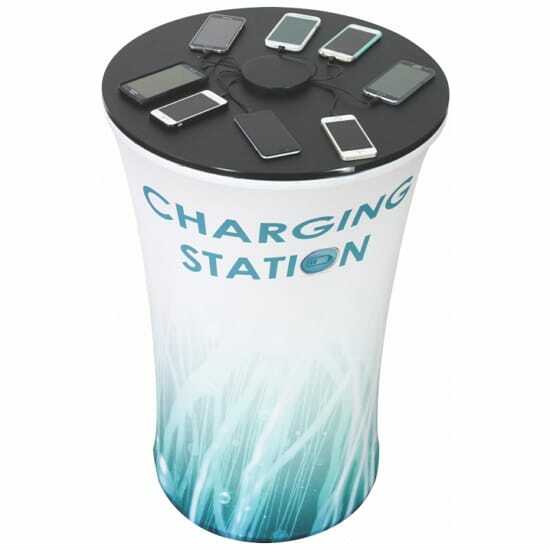 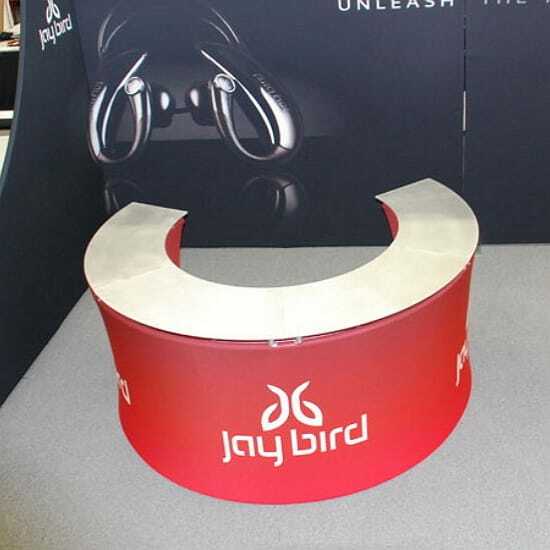 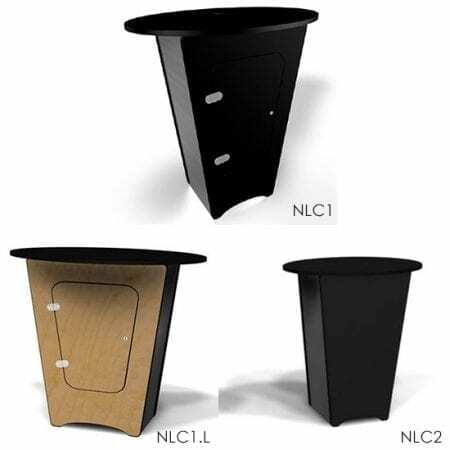 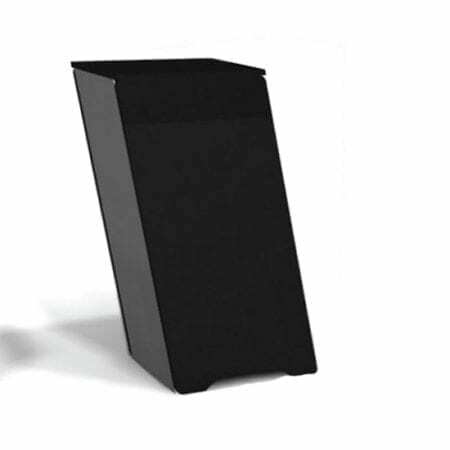 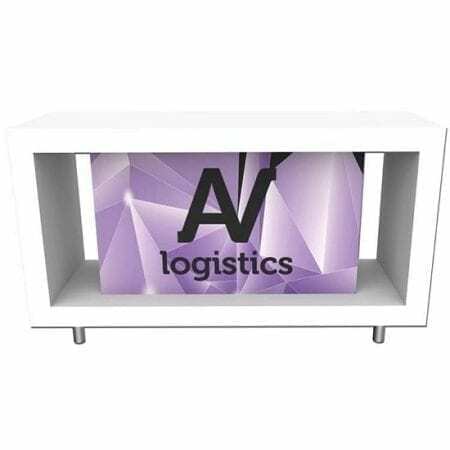 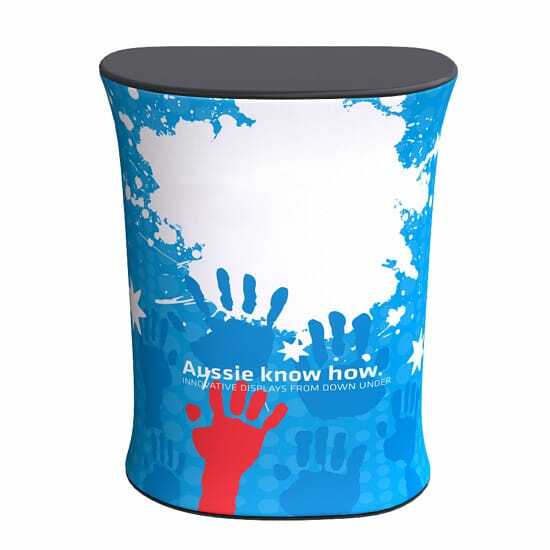 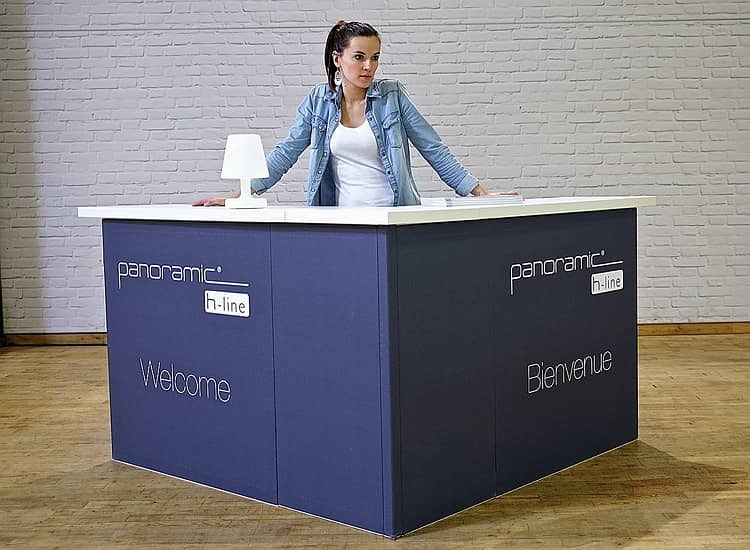 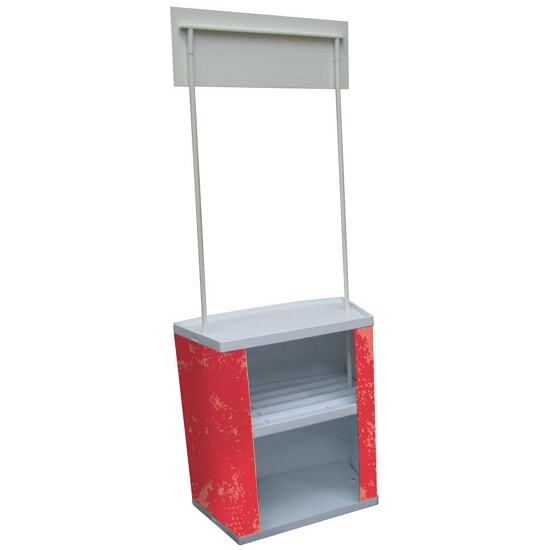 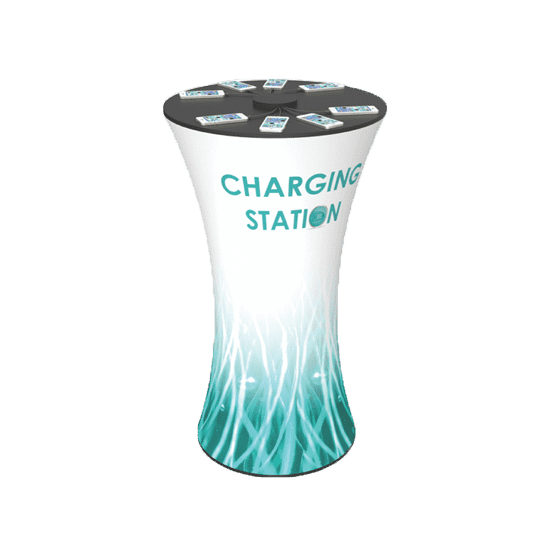 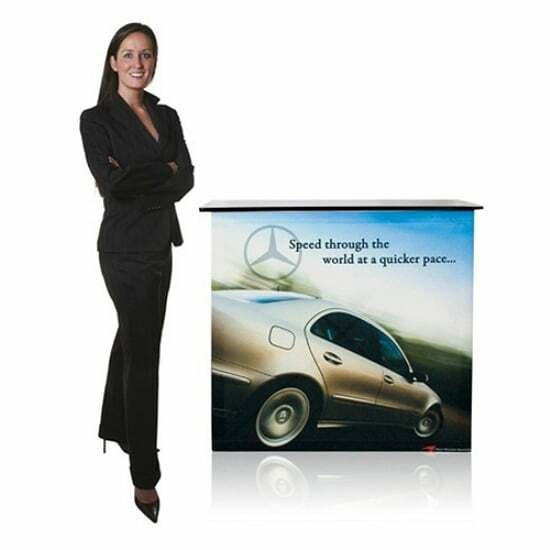 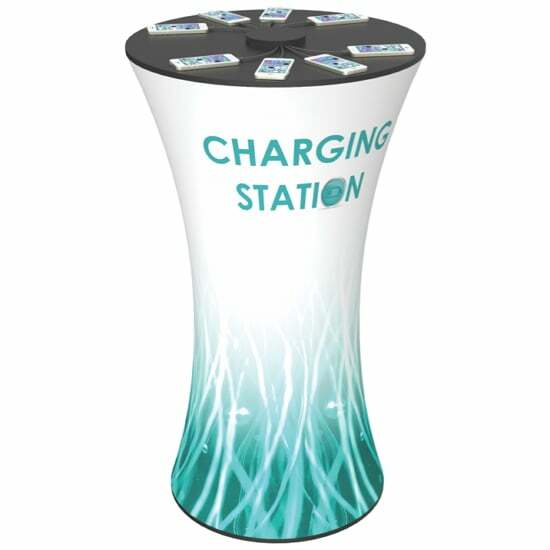 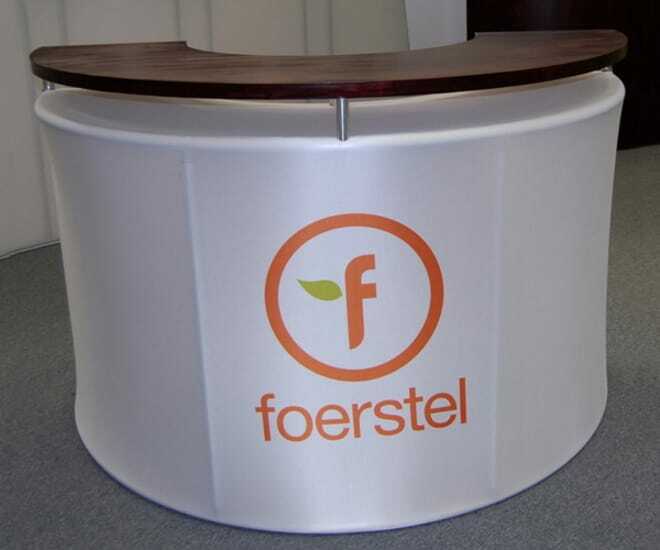 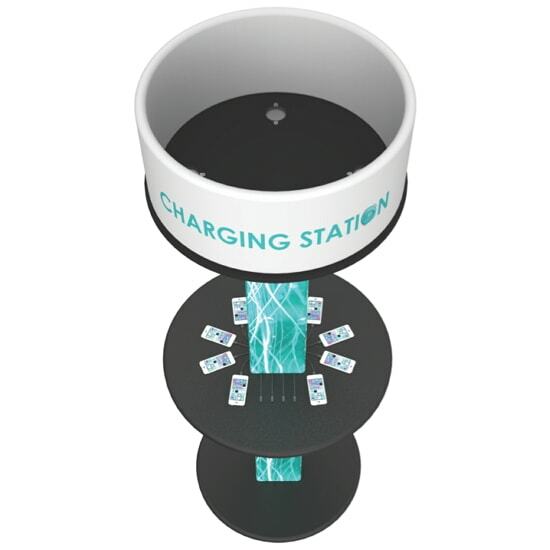 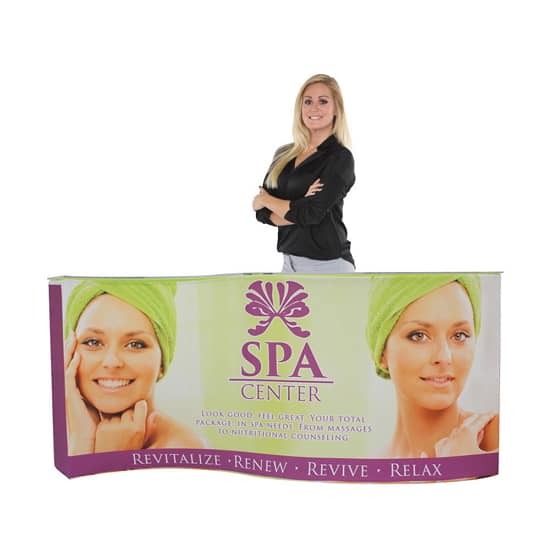 This demonstration table display or promotion counter is ideally suited for branding with custom logos and graphics, creating a high impact traffic stopper. 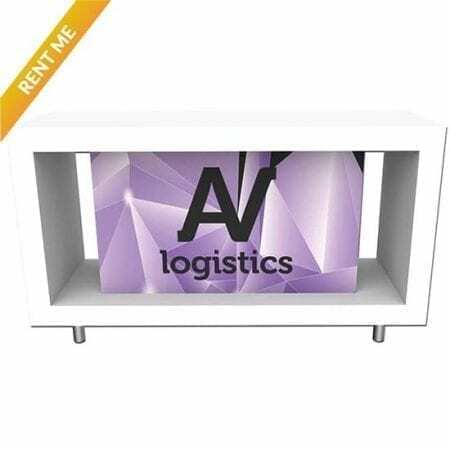 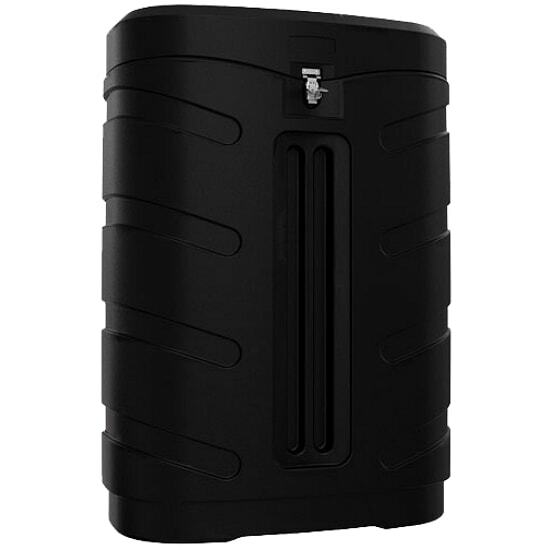 This light-duty indoor and outdoor portable counter is made of plastic and designed for easy transportation with carrying bag. 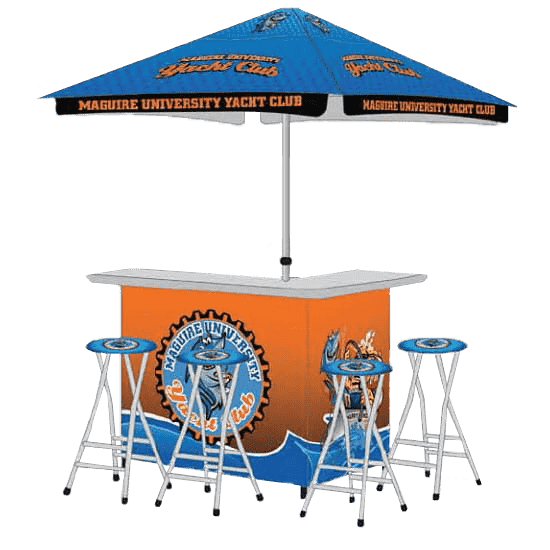 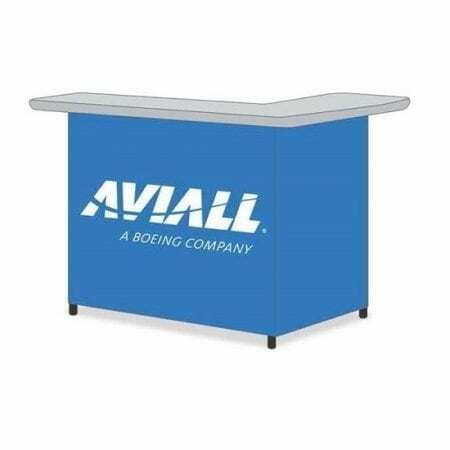 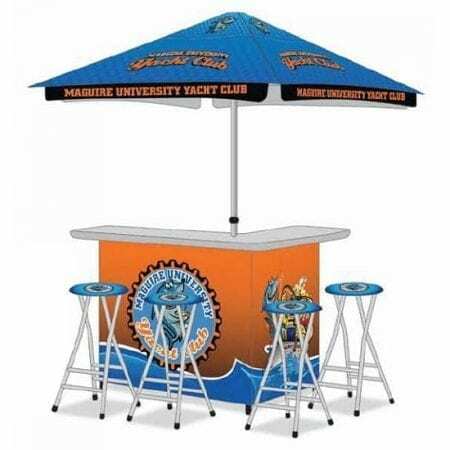 Be the talk of your next event with a unique, custom-branded indoor/outdoor bar! 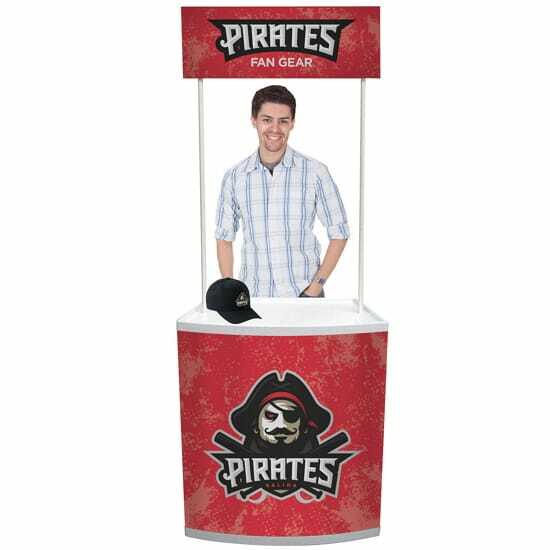 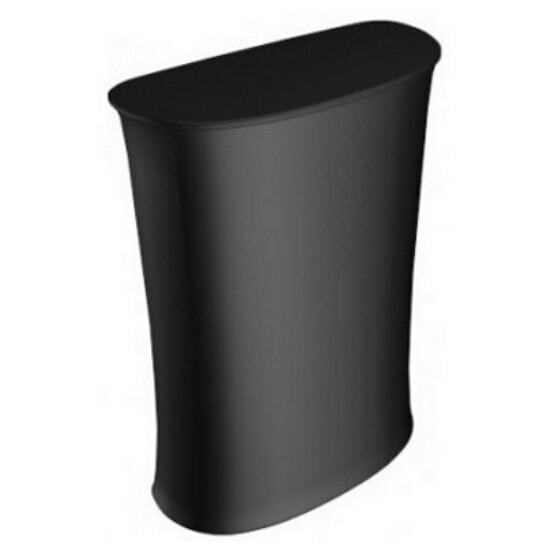 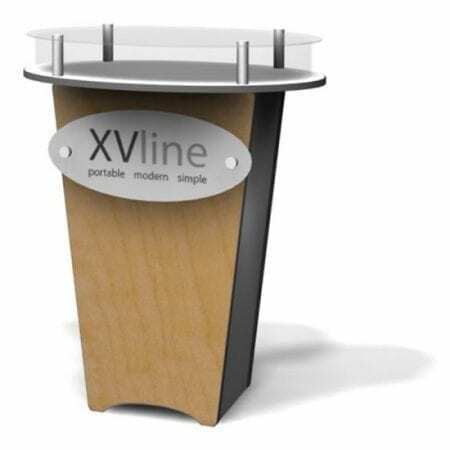 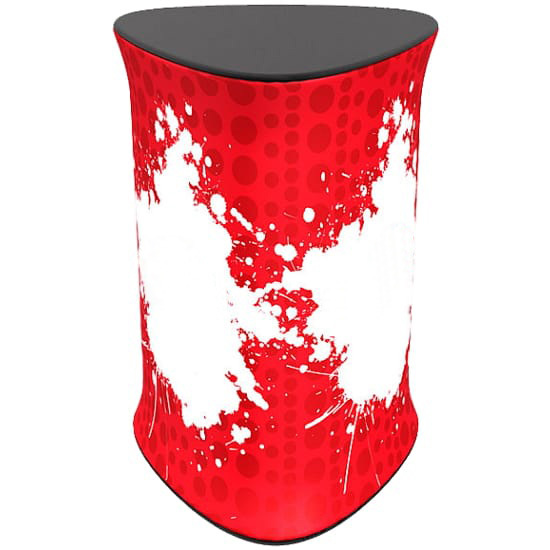 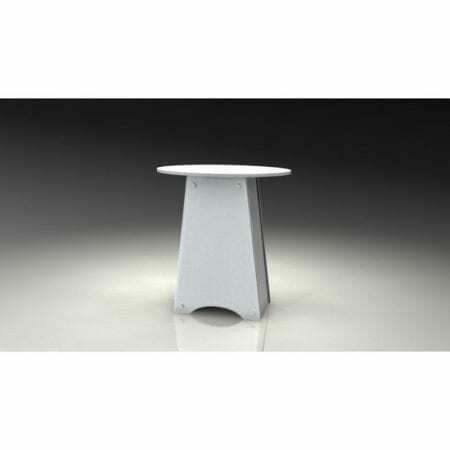 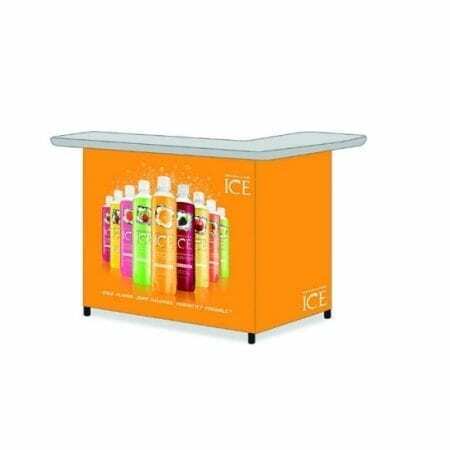 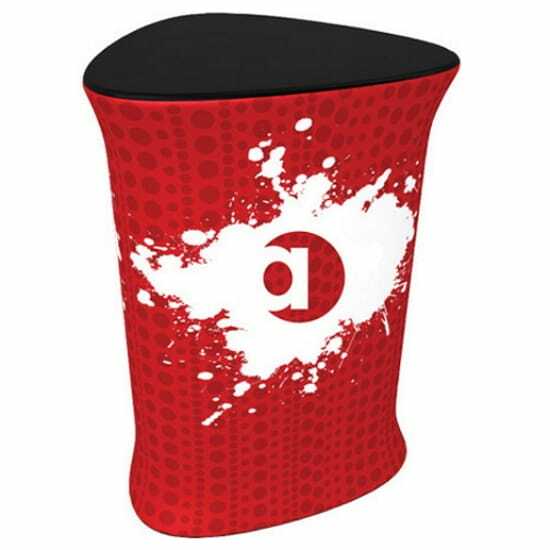 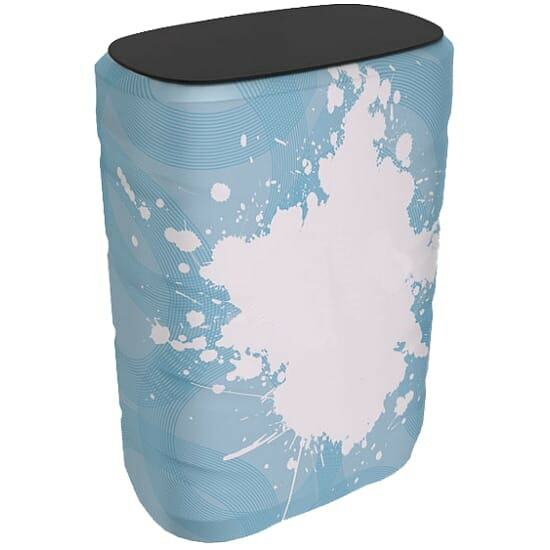 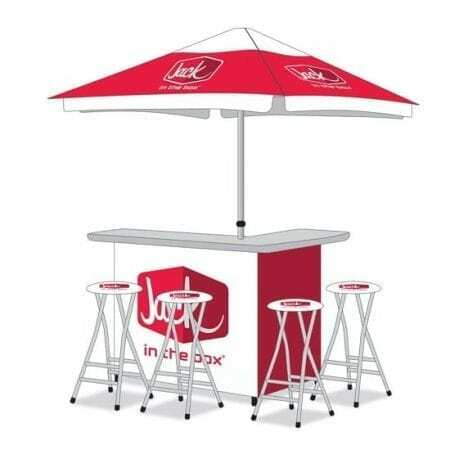 Completely portable and brandable, ideal for consumer interaction, product sampling, hospitality and entertainment. 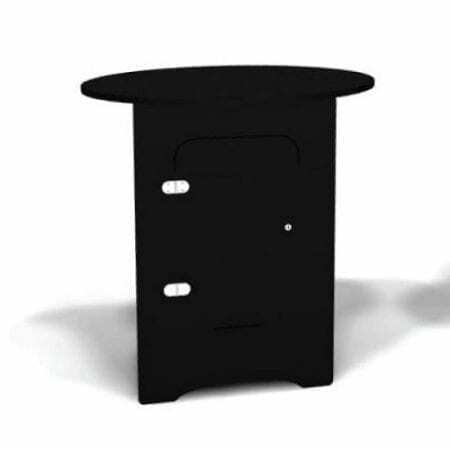 Features plenty of seating and storage. 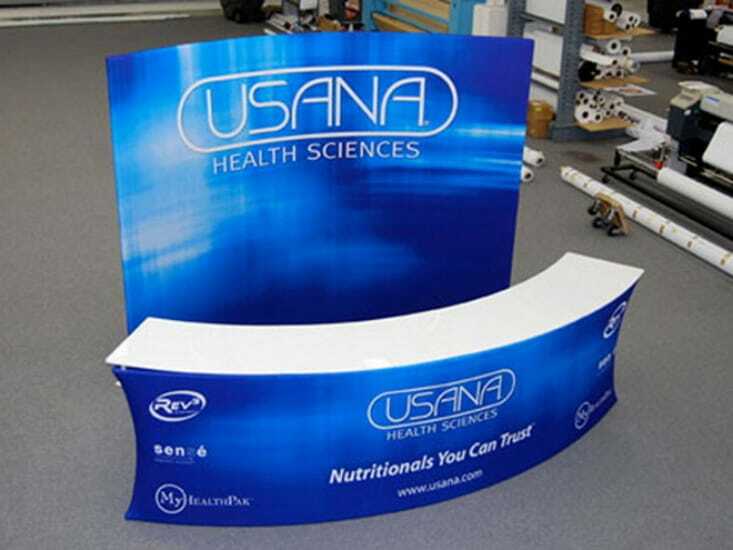 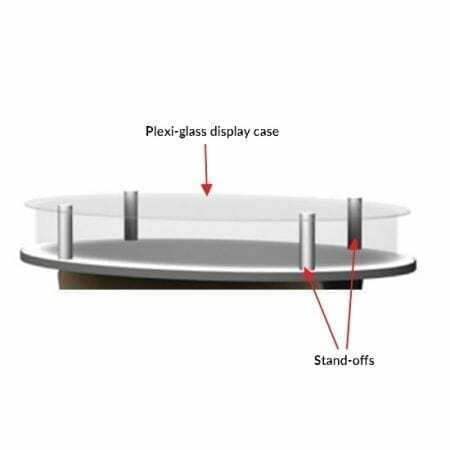 Our Panoramic Display Counters are available in a small with a work space measuring 28.4″W x 17.3″L, and a large with a work space measuring 47.25″W x 17.3″L. 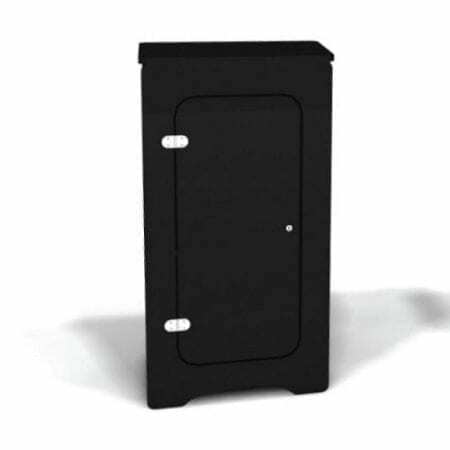 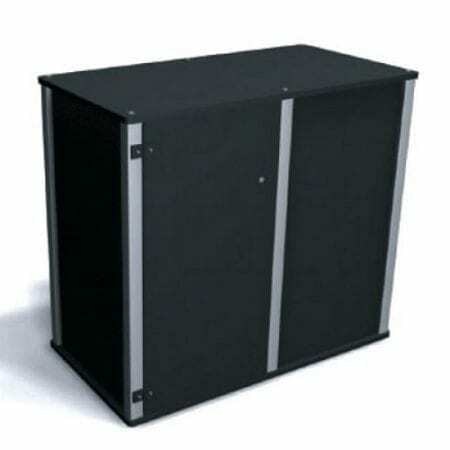 Available with or without locking door. 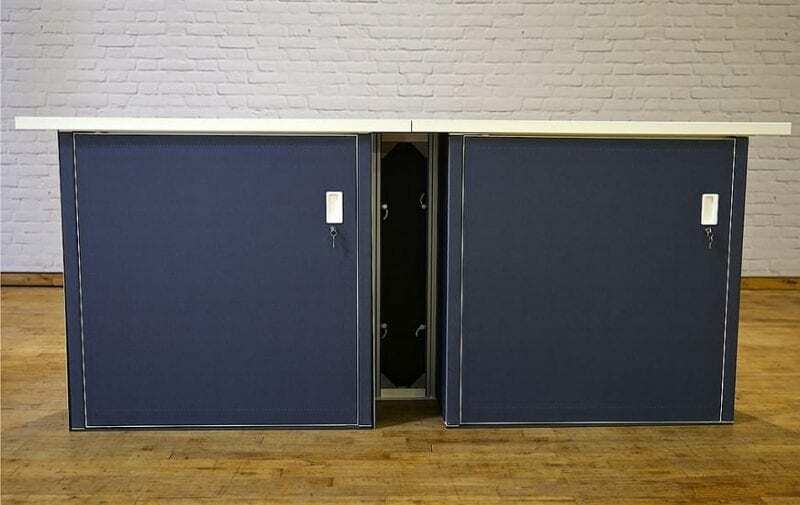 Increase your work space by adding one of our Connector Components. 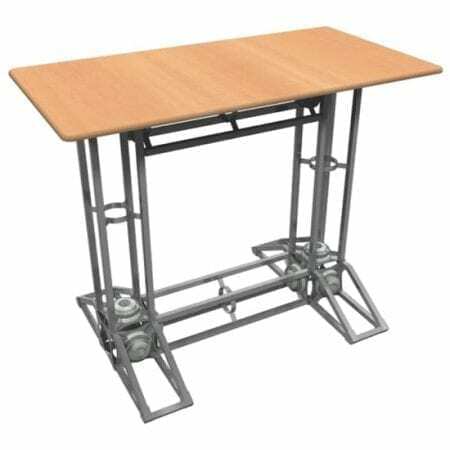 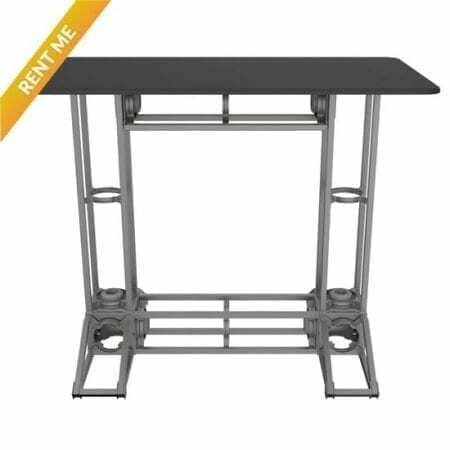 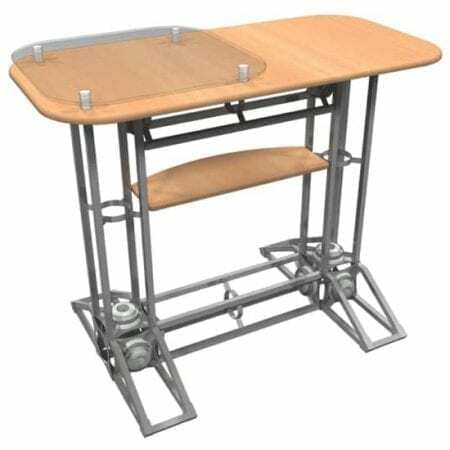 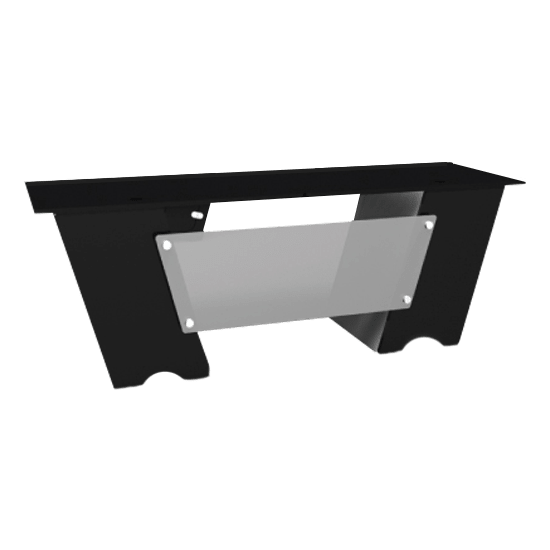 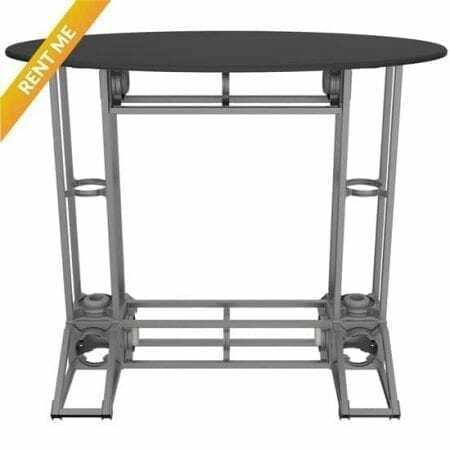 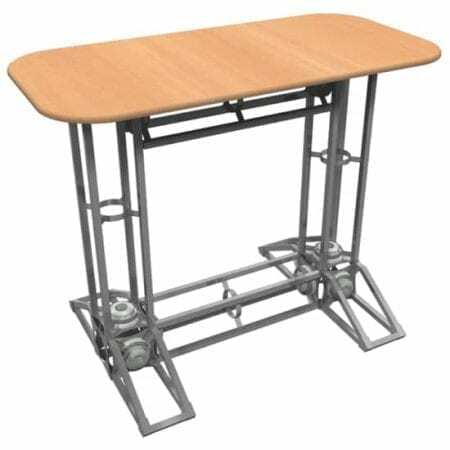 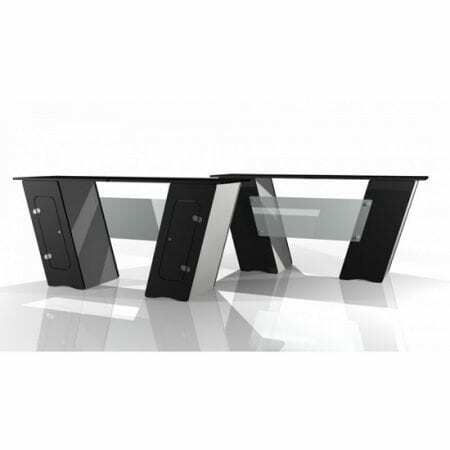 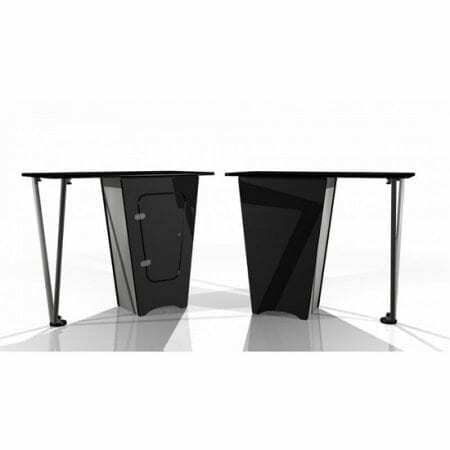 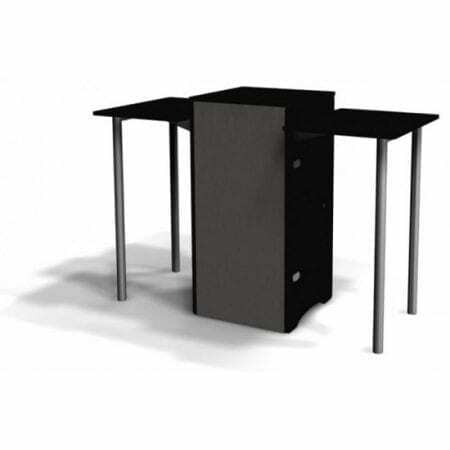 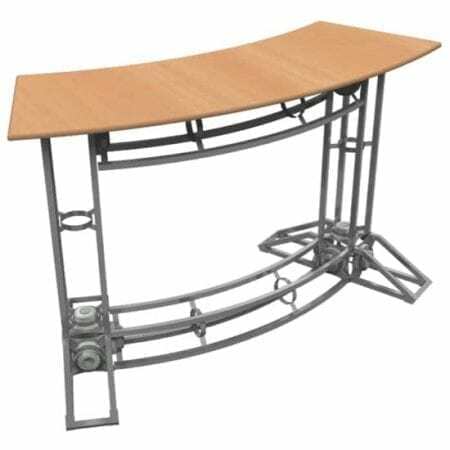 Available in a 8.65″w x 17.3″l to create a Double Counter with 94.5″ of work space, or, choose the 17.3″w x 17.3″l to create a Corner Counter. 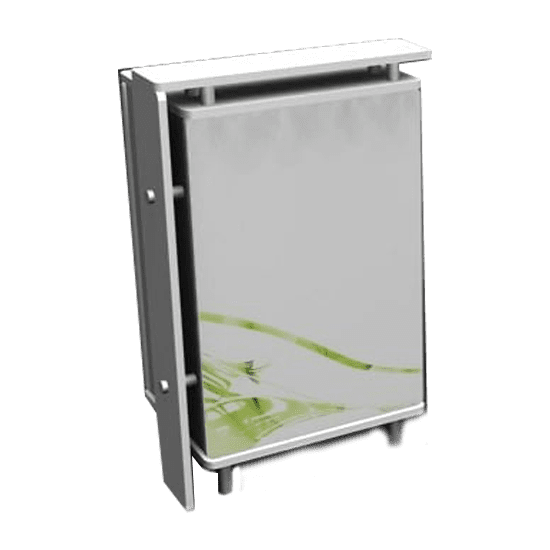 Increase your visibility and brighten up your exhibit with a Light Box Counter, measuring 38″w x 38″h, with 47.25″w x 17.3″l of work space and a optional locking door. 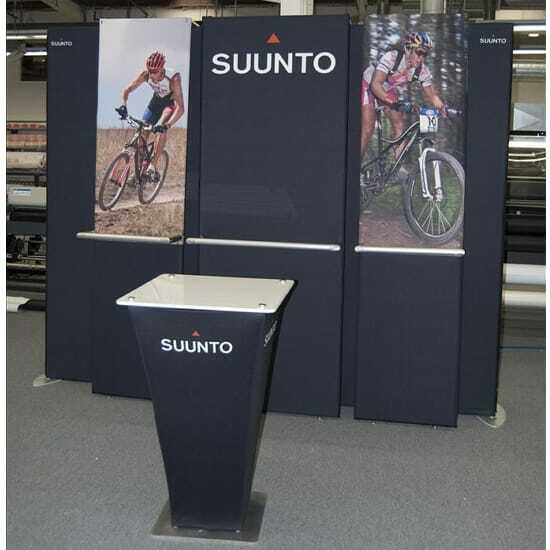 Add depth to your exhibit and work space by adding a Demo Counter Component. 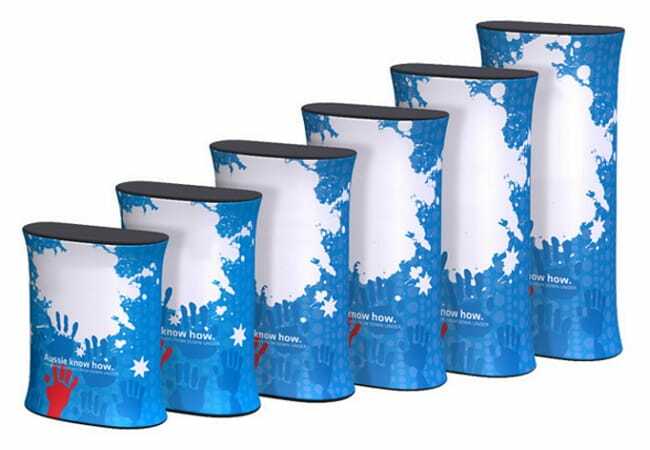 Each counter comes with hardware and dye sublimated graphic. 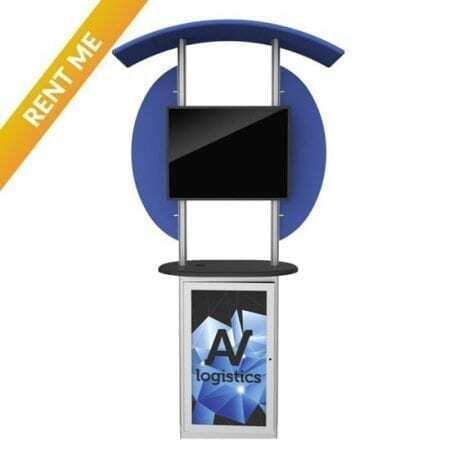 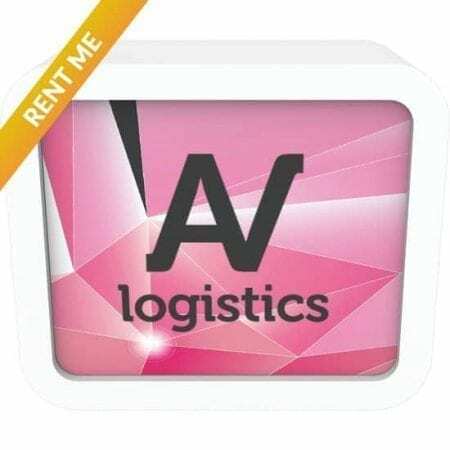 Available for Purchase or Rental. 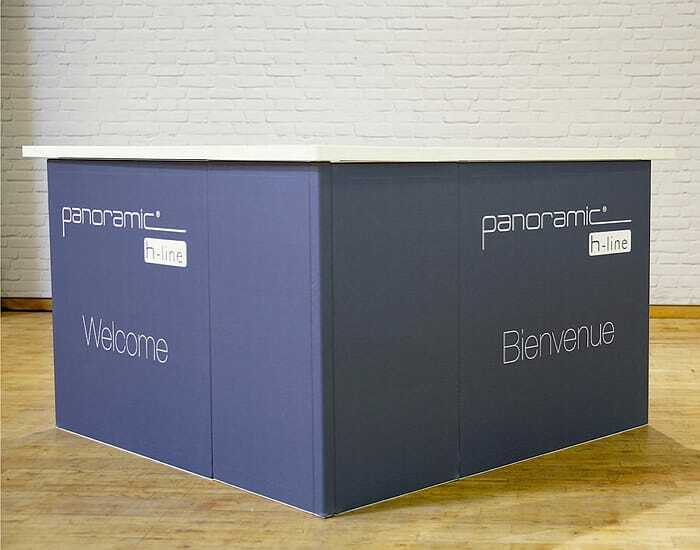 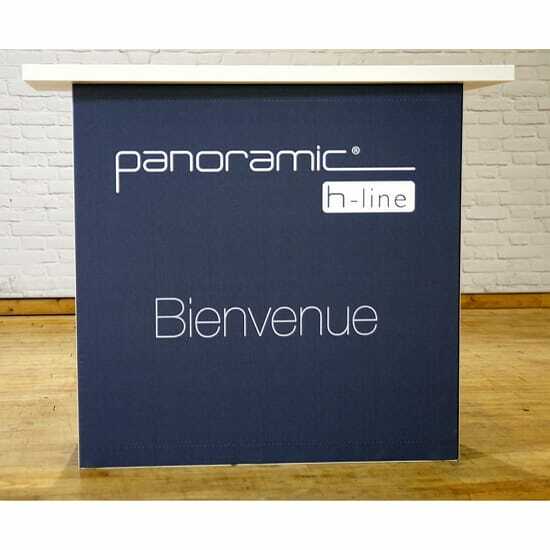 Visit our Panoramic Display Solutions page to see more and learn how to create your own customized Panoramic Display Solutions. 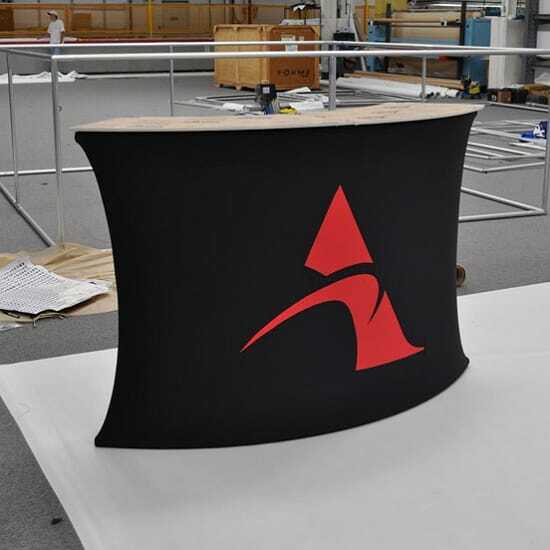 Visit our Custom Tension Fabric Counters page to see more and learn how to create your own customized Custom Tension Fabric Counters.